I have a late-2016 MacBook Pro, and, like many people with that generation of laptop, I recently fell victim to the Flexgate display problem. Flexgate refers to a design flaw in the ribbon cable connecting the body of the laptop to the display: that cable is supposed to flex with the opening and closing of the computer, but it’s wearing down too quickly with conventional use. Uncovered by an iFixit report and named by one of the site’s users, this problem is dramatically compounded by the fact that the cable in question is affixed to the display — so the only means of repairing a fault with the cable is the total replacement of the display. Which isn’t cheap. Owning a Mac has always been an expensive business. I couldn’t afford to even think about a MacBook during my university years, and then it was only because my first writing job demanded a Mac that I bought my first laptop from Apple. But in the decade since then, the mantra of “you get what you pay for” has stayed true with Apple. MacBooks have long been the most reliable laptops with the longest-lasting batteries, the best touchpads, the prettiest displays, and the best construction. Apple’s quality assurance and after-sales customer support also tower above PC-making rivals like Dell, HP, and Lenovo. It’s because of that habit of charging premium prices and that pedigree of excellent customer service that I expect more from Apple than I would from other manufacturers. My experience of having my MacBook Pro repaired was a fortunate one, as I already had AppleCare covering the £391 ($520) expenditure. But what about all the people who bought an Apple laptop in early 2017, expecting it to live up to the company’s reputation and last for many years? iFixit says the Flexgate flaw means it’s a matter of when, not if, your MacBook’s display cable will give out. In the European Union, consumer protection dictates a two-year warranty on all products, and it seems like the Flexgate issue is becoming apparent in most affected laptops right around this two-year mark. That means that just as your statutory rights to free repair are running out, you’re getting hit with an intolerable display malfunction. Although still soldered on, the new display cable (left) is 2mm longer on the 2018 MacBook Pro. Apple seems to be aware that this is a problem. 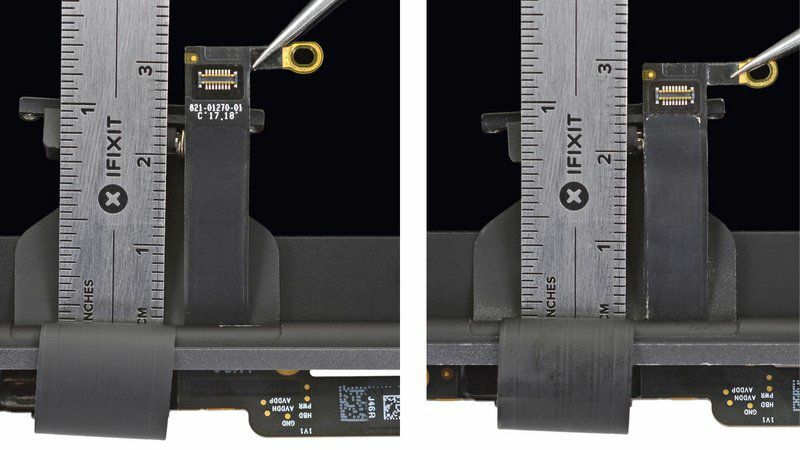 In a follow-up report on the 2018 MacBook Pro refresh, iFixit found that Apple had elongated the display cable design, ostensibly to get rid of the defect that plagued the 2016-and-later laptops that preceded that update. That change happened without any public acknowledgement, and, to this day, Apple continues to act as if Flexgate is not a real or widespread problem. I reached out to Apple repeatedly to try and get a comment from the company on the Flexgate situation, but have received no response. In my conversations with Apple support staff, which included phone calls with support centers in the UK and the US, as well as repeat visits to the Apple Covent Garden store in London, no one within the company seemed aware of Flexgate as a problem. Worse, threads started by aggrieved MacBook Pro owners who’ve suffered the Flexgate calamity have reportedly been deleted from Apple’s support forums. Apple, I’d like to believe, is better than this. And yet, the company has previously shown itself slow to acknowledge issues with its butterfly keyboards and iPhone batteries. Both problems were eventually addressed in a satisfactory manner, though they did undermine the sense of trust that Apple works hard to engender in its users. The infamous Bendgate episode surrounding the iPhone 6, which Apple would later be shown to have known was more likely to bend under pressure, was left unresolved. The subsequent iPhone 6S just magically happened to be made of stronger stuff. I don’t blame Apple for Flexgate. Design problems can and do arise. But the company ought to live up to its own aspirations by acknowledging the issue and treating its customers fairly.